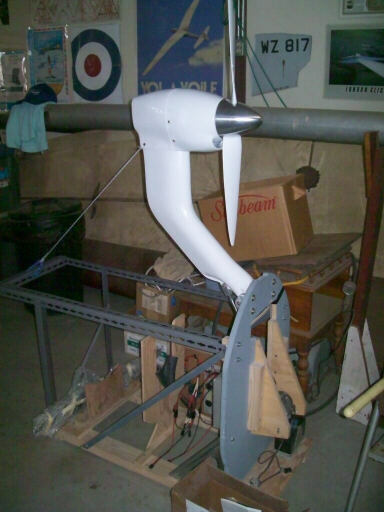 Friday night after work, I zapped together this display stand for the horizontal stabilizer. 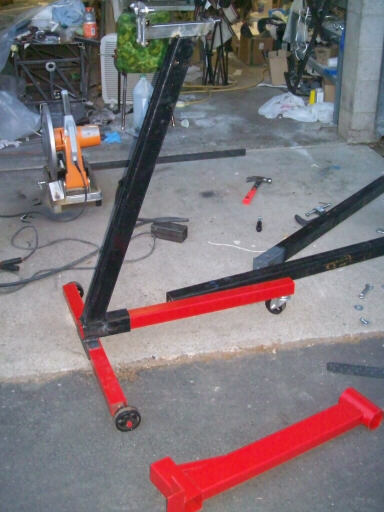 Most of its parts are from an engine stand I borrowed from Steve Smith. All I did was to make a dulplicate of the original vertical stanchion, and weld to it the stabilizer mounting fixture I'd made the earlier weekend. Brigitta dons safety glasses and proceeds to scrape away some of the scaly deposits left along the leading edge bondline seam. Saturday morning at 4:00 AM I hopped into our Volvo 740 wagon and proceeded down to Tehachapi. For the past several years, my tradition has been to borrow or rent a car for this trip. But this time I had that darn stabilizer with me, and anyhow I was pretty sure the Volvo would get me there and return me safely home. Two photos of the Sparrowhawk electric self launch demo package that Greg Cole brought down. The smile inlet and oval outlet are cooling air for the 8% or so of power that turns into heat. 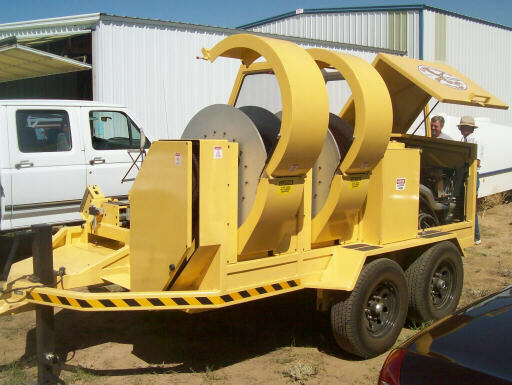 Two photos of the Roman Design two-spool diesel winch. The output from a heavy-duty automatic transmission on a V8 diesel engine drives a small cogbelt pulley. The larger cogbelt pulley at the other end of the belt drives a shaft that goes through the axes of both spools. 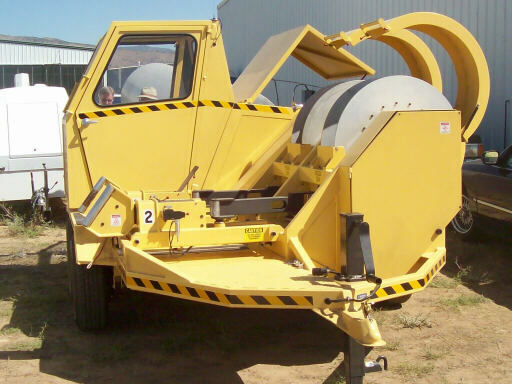 Each drum can be independently dogged to the shaft. 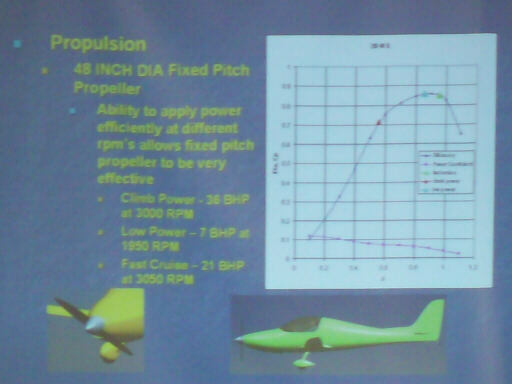 A photo of a slide from Greg Cole's presentation on the Goshawk electric airplane. The side view shows the configuration pretty well; based on the wing and pilot positions it looks to me like the batteries go behind the seats. 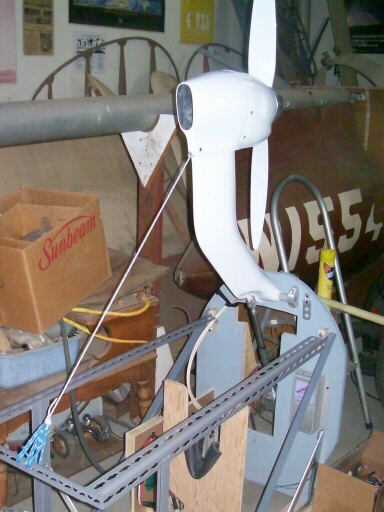 The span, area and aspect ratio of the wing makes it pretty clear that it uses the wings he's developing for the Duckhawk racing/exhibition sailplane. 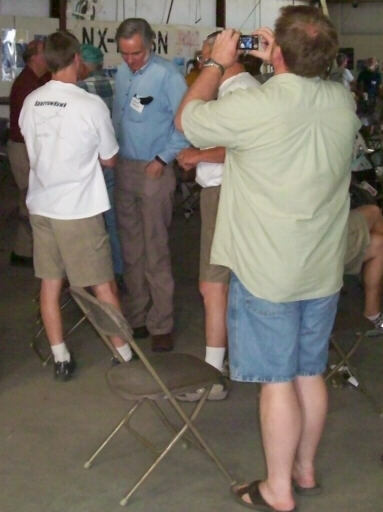 Sailplane repair guru Paul Gaines takes a photograph of Burt Rutan chatting with Greg Cole. You can't see it in this photo, but Burt's name tag bears the name "Chuck Yeager." 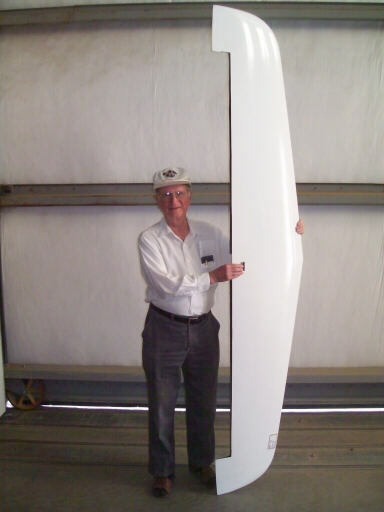 Here Bruce Carmichael holds my horizontal stabilizer vertically. 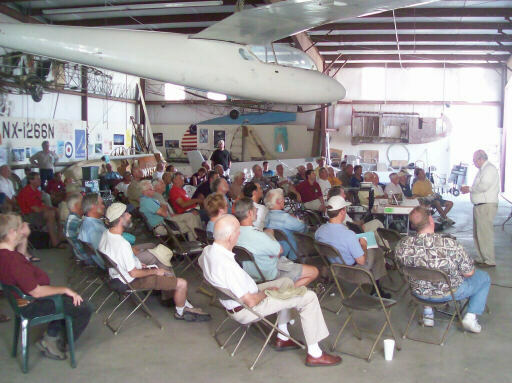 A good crowd of the usual suspects gathered in Jeff Byard's hangar. 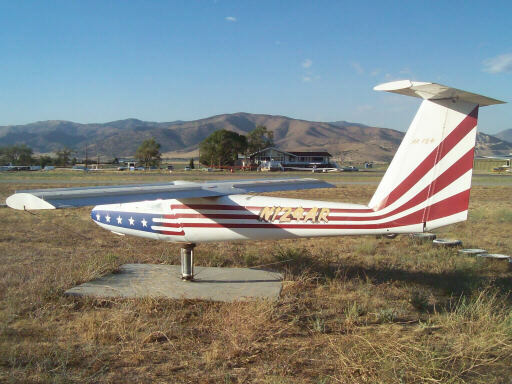 Two photos of the wind tee at Mountain Valley airport. Somehow I thought I remembered this being a Pacific D-8 glider built from those plans they used to avertise in the back of Popular Mechanics magazine. 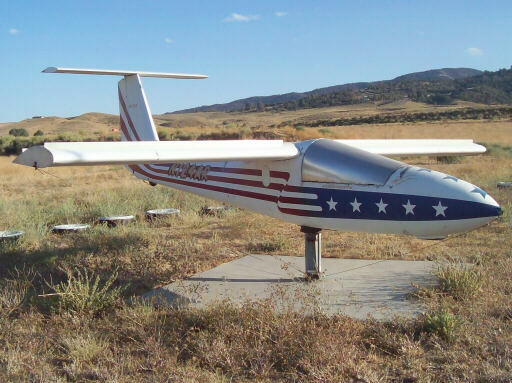 However, this glider looks to have a more various heritage. The wings and part of the fuselage might be D-8, but I think the vertical tail is from single-place Lark. After that, I packed up and left, intending to drive to Yosemite Valley and find some party to add me as a third for a jaunt up the Royal Arches and down the raps (but not down the North Dome Gully, thanks). Instead, my car quit running at the north end of Bakersfield. I ended up staying in Bakersfield for two nights and a day while I tried to resuscitate the Volvo using only a printout of the LH-Jetronic error codes and parts and tools you can obtain in Bakersfield on a holiday Sunday. 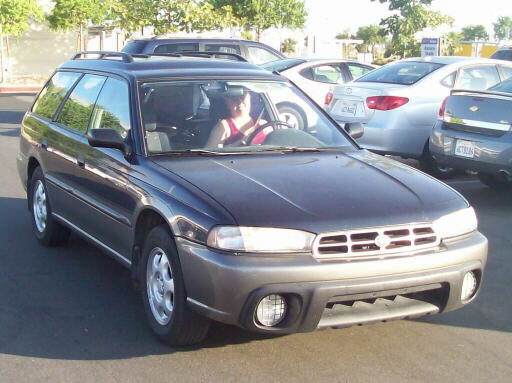 Failing at that, I balanced the cost of retrieval, diagnostics, and repair (pretty high) against the value of a worn-out 18-year-old car with a quarter million miles on it, and decided to just sign it over to whoever would get it off of the side of the freeway. 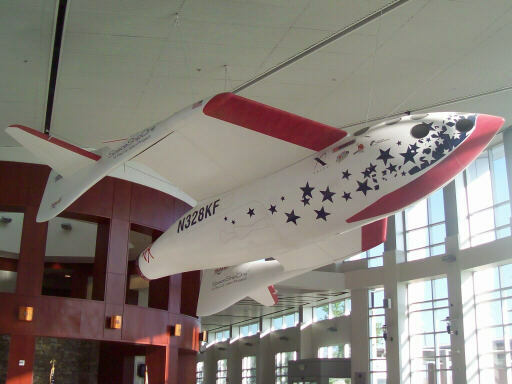 Sunday morning I happened upon this mockup of Spaceship One hanging in the terminal of Meadowes Field when I walked there to rent a car. 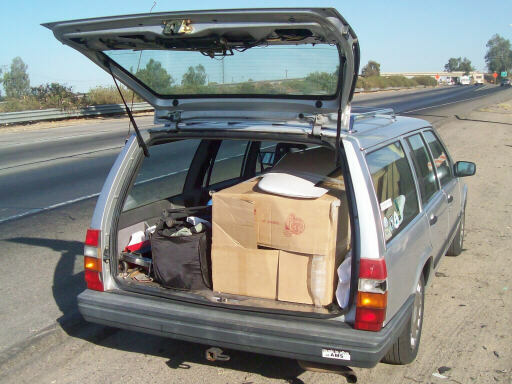 With my rented Grand Marquis, working on the Volvo on the side of the freeway in Bakersfield. I wished I could have rented a smaller car, but everything else except a Ford Explorer was taken. But I was glad for that pigdog's bulk uproad of me while I was lying on the ground under the Volvo changing the fuel pump and filter. The Volvo's last service was to soak up the Bakersfield sun and post-cure the horizontal stabilizer for me. 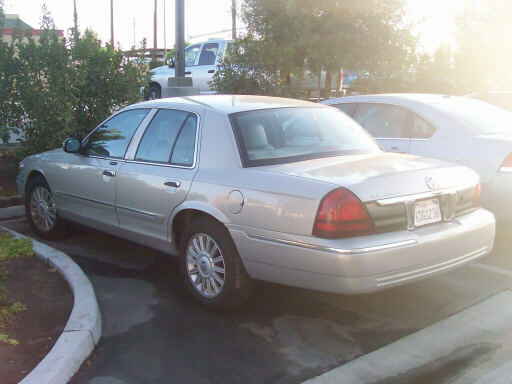 The Grand Marquis, which I disaffectionately took to calling the pigdog, as I do with every rental car that displeases me. The very opposite of damsel in distress, Brigitta arrives in our Soobie adventure car to take me home on Monday morning. 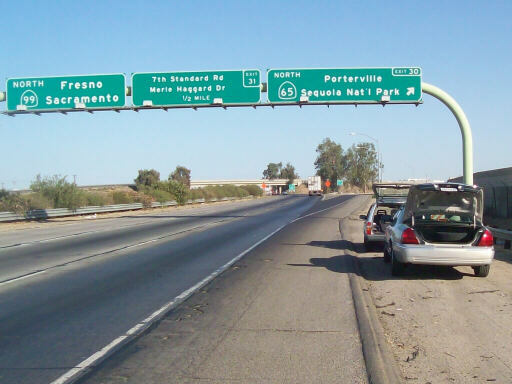 We took 99 north to Fresno, and then 41 and 49 north along the foothills.